Turkey's unique geographical position, at the junction of the continents of Asia and Europe has had a strong influence on the country's history and cuisine. It should also be remembered that Turkey was once the center of the Ottoman Empire which included territories across the Middle East, in North Africa, and as well as in Southern Europe. The Ottomans had influences with many different peoples and cultures, and were thus able to combine influences from Arab and Middle Eastern cuisine, as well as Armenian cuisine, Greek cuisine and and Persian cuisine with traditional Turkic elements such as the use of yogurt in many dishes. Southeastern Turkey, including the regions around the city of Adana, is famous for kebabs and mezes, as well as desserts such as baklava, kadayif and künefe. Central parts of Anatolia, including the capital city, Ankara, is known for both sweet and savory pastry dishes. Those regions of Turkey which lie near the Black Sea coast are known for corn and anchovies. The area around the Sea of Marmara (including Istanbul), as well as the regions on the Aegean Sea and Mediterranean Sea coasts, incorporate typically Mediterranean styles into their food, and make extensive use of olive oil in cooking. Iskembe Çorbasi - A soup made from tripe (the stomaches of cattle). It is seasoned with vinegar and lemon juice. Tarhana - Tarhana is a a dried food, prepared by creating a fermented mixture of cracked wheat, yogurt and vegetables. Because of its dryness and acidity, Tarhana preserves extremely well. When eaten, Tarhana is usually made into a soup. Today ready forms of Tarhana can be found as "quick soups" in many stores - simply add hot water. Hummus - A dip or spread made from ground chickpeas with sesame tahini (ground sesame seeds), lemon juice and garlic. 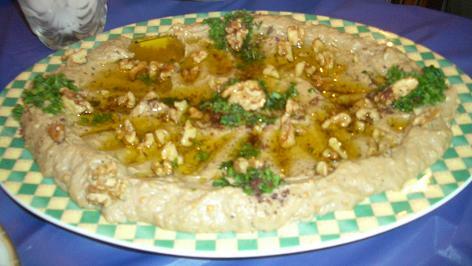 It is often eaten as a side dish or appetizer, frequently with pide (Turkish pita) bread. 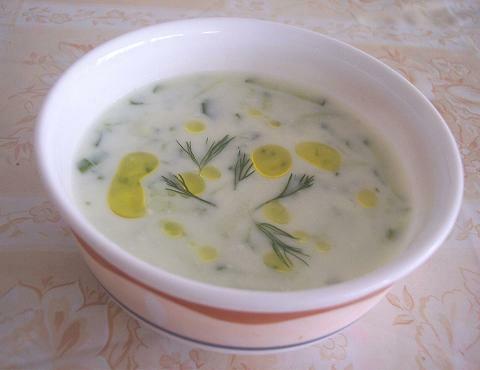 Cacik - Cacik is the Turkish variant of Tzatziki - A cold dish made with yogurt, cucumber, dried mint and olive oil. Kuskus - The Turkish version of Couscous. Dolma - Stuffed vegetables. Dolma can be made using minced (ground) meat ("kiyma") with onions, rice and spices and served hot, or made using vegetables and served at room temperature. Börek - Dough stuffed with cheese, meat or vegetables. Gözleme - A savory pastry made by thinly rolling dough and repeatedly folding. It is then filled and browned in a pan. There are many different variations, each with their own names, including Etli (meat filling), Ispanakli (spinach), Karisik (mixed filling), Katmer (plain), Kiymali (ground lamb), Mantarli (mushrooms), Patatesli (mashed potatoes) and Peynirli (filled with feta cheese). Lahmacun - Flat round pieces of dough, covered with ground (minced) meat - beef or lamb. It is served rolled up, with vegetables (onions, tomatoes, peppers, etc.) or pickles, and is often called "Turkish pizza"
Manti - A Turkish pasta made from dough balls filled with ground (minced) meat. It is served with yogurt, flavored with herbs and spices, and warmed in olive oil or butter. Keskek - A stew made from meat and barley or wheat. Karniyarik - A dish made with eggplant (aubergine), ground (minced) meat, tomatoes, onions and garlic. Patlican salatasi - "Patlican salatasi" is Turkish for "eggplant salad". Basically the dish is cooked aubergine that is allowed to cool to room temperature, and then mixed with either lemon juice and garlic, or with yogurt, olive oil and garlic. Imam bayildi - Literally translated from Turkish, "imam bayildi" means "the imam fainted". The dish is actually somewhat similar to karniyarik, containing eggplant (aubergine), tomatoes, onions and garlic, but does not contain meat. Patlican begendi - Another eggplant (aubergine) dish. This is a hot dish which as well as eggplant also contains meat, cheese, milk and flour. Menemen - Eggs with green peppers, onions and tomatoes. Döner kebap - Literally translated from Turkish, "döner kebap" means "turning roast". Döner kebap is meat (beef, lamb, mutton or chicken may be used) cooked on a rotating spit, and served in a sandwich made from pide (Turkish pita) bread. Today döner kebap is a popular fast food around the world, and salad and sauces are often added to inside the pide - this idea was invented by the Turkish community in Germany who wanted to broaden the dish's appeal. 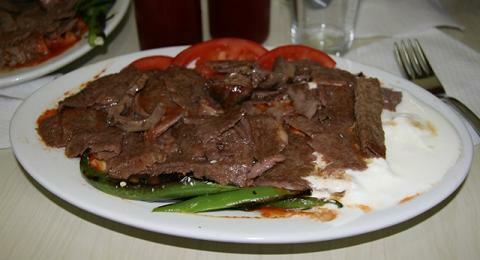 Bursa kebab - This dish is known by many names. It was originally invented by Iskender Iskenderoglu and initially called "Iskender kebap" (which is a trademark), but variants are found in many Turkish restaurants around the world. Grilled lamb slices, cooked in the same fasion as döner kebap, are basted with tomato sauce and layed over pide (pita) bread, then covered with melted butter and yogurt. Adana kebap - A long grilled kebab made from minced lamb, originally from the city of Adana, where it is known as "kiyma kebabi". Shish kebab - Grilled chicken or lamb, marinated and cooked on a skewer over an open fire. Lamb from milk-fed lambs is particularly favored. Arnavut cigeri - Fried liver. Köfte - Meatballs made from ground (minced) meat mixed with bread and egg. There are lots of different versions of this dish including "Çig köfte" which contains raw ground (minced) meat, and "kadinbudu köfte" which contains rice (and cooked meat). Mahmudiye - This dish has its origins in the Ottoman Imperial court. It is chicken with almonds, apricots, black pepper, currants and honey. Sujuk - A traditional Turkish cured sausage made from ground (minced) beef with spices. The sausage is prepared using a process involving drying for several weeks. Before eating, sujuk is cooked - it is popular both for breakfast and as a form of fast food (often eaten with bread). Helva - A traditional sweet made from semolina, tahin (sesame seed paste), wheat flour. 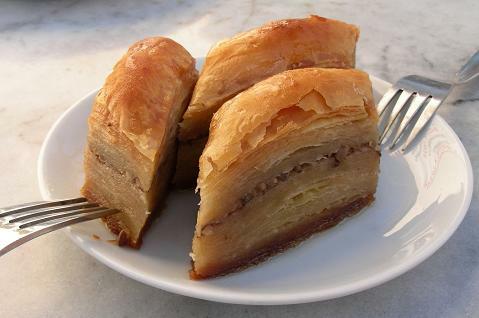 Baklava - Perhaps the most famous Turkish dessert. Baklava is a sweet pastry dessert made with phyllo dough, filled with pistachios or chopped walnuts, and finally sweetened with honey or syrup. Kadaif - Kadaif is the name given to a variety of different desserts made from shredded dough or phyllo pastry. There are a huge variety of different types of kadaif available - but look out for "künefe" - a version which contains melted cheese and is served hot with walnuts and pistachios.